It is so good to be reporting on football again even though the Raiders have only been at camp for four days. But with four days of hard work in the books the Raiders and their new look roster have no question have some players who are looking to step up to the plate. One player I am hearing great things about second string QB Terrelle Pryor who is trying to win the starting job which is a long shot in itself. Pryor is known for his amazing speed and making defenders miss left and right but he lacks accuracy and especially arm strength. Pryor started the last game of the season in 2012 for the Raiders in San Diego. In that game Pryor went 13 of 28 for 150 yards and 2 touchdown and only 1 pick, more importantly the Raiders lost 24-21. 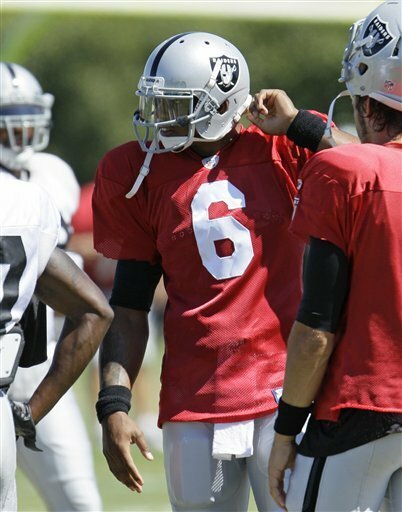 But this is a new year and in 2013 Pryor is showing impressive arm accuracy and improved arm strength, hopefully he can continue to improve as camp goes on for the Raiders. Pryor will have no trouble being named the number two quarterback but like I said it is a long shot for him to be named the number one guy without someone getting injured. I say this because Matt Flynn has taken over the Raider offense and become a leader on the team. He has already developed great chemistry with the wide receivers and his arm is looking solid. That says a lot considering what he has to work with, the Raiders do not have a lot of known names at the receiver position. Denarius Moore is their number one guy for sure and it looks like Rod Streater will be taking over the number two role with Jacoby Ford getting hurt yet again. The Raiders offensive success either way will be determined on how well Darren McFadden does in Greg Olson’s offensive and from the first looks at camp, he seems to be back to his old self. McFadden is very happy to be running in a power running game and is looking unstoppable yet again. If McFadden stays healthy, I know we stay that every year, he will no question get over 1,000 yards. Now onto the defense… from what I am hearing MLB Nick Roach has looked great in the middle of the Raider defense and has been the clear leader of the defense. The Raiders had not had a real MLB since Greg Biekert who left after the 2001 season. If the Raiders are going to win games this season and stop people from scoring, Nick Roach is going to have to take command of this defense and show all these young guys how it is done and be that mentor they look up to. I am sure as more time goes on more guys will step up, they will need to for the Raiders to have any success at all in 2013. If the Raiders have another 4-12, 5-11 season Dennis Allen and Reggie McKenzie are out in my opinion. Dennis Allen knows he is on the hot seat this season and needs to win games and win them now. The pack include UDFA pickup and a 5th rounder with a 4th round PR/KR…. AS much as we’d like to blame(scapegoat) the OC for the offensive woes last year. The fact defences didn’t respect the throwing game (Even with Pro bowl QB) meant the running game became a focus, and DMc stuffed. On Defence it’s hardly looking ‘fixed’ is it? It’s great that Nick Roach is looking great, he will lead the Raiders in tackles, because lets face it, who’s going to stop any RBs ahead of him?? The DT’s,(Defensive Turnstiles?) are unproven and opponents will be running on them all day. WR’s for the opposition with probably not even bother suiting up!?!?! Basically, while the Cap deficit still hangs around, the Raiders are going to to be understaffed and I look forward to a high draft pick next spring…. Patience Patience, is always hard to find when your expectations are a far reach. Many of us have been there from the good days through the sad days. I hope Mark Davis can have the patience to allow his organization to put in place the needed parts. It is a time issue and most people do not have the patience to grant it when you haven’t won in 10 years. I think Reggie and Allen are doing it the right way but will they be given the time required, I doubt it, which will bring us back to where we started. There will be more suffering before we see the improvement but I think the current management team can pull it off if allowed. Only time will tell if that will happen. We all know the local media will not give them any slack to improve, so its up to us fans to stand behind current management to make the improvements. It won’t take long before we see the results of what they are trying to do. Raider fans need to hang in there because you are all they have. Local media will not show any support so its up to us.